Working at the data centre has been fine. It’s very boring and repetitive but it’s also very easy and low stress. My audiobooks get me through the day. Gulp by Mary Roach, a book about the entire alimentary canal, from eating to pooping. It was interesting, and at times gross. The Kitchen House by Kathleen Grissom, a book set in 1790 about slavery and stuff. Freakanomics by Steven Levitt, a book using economics to explain random stuff. It was interesting I guess but I can’t trust anything anyone says if it’s only based on one person’s research. Let’s Explore Diabetes With Owls by David Sedaris, another one of his usual books. Entertaining. and I started Sharp Objects by Gillian Flynn today. I seriously love love LOVE that part of the job. Who else can say they finished four books in four days?! If any of you readers have boring jobs I highly recommend audiobooks. Until that happens I will continue to paint my nails multiple neon colours. 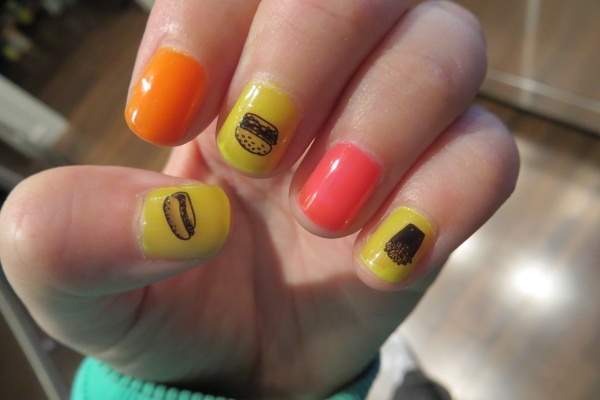 Those awesome food nail decals are from my internet friend Sara M Lyon’s Etsy shop, btw. They were pretty easy to apply and are super cute! I love everything that she makes. I’m going to the Fraser Valley Food Show this weekend, as a food blogger. I get to be driven there by a car service. FANCY. Hopefully we make it in time for the sausage making competition. I haven’t been to this food show before but it sounds pretty similar to Eat! Vancouver and Eat! Vancouver is AWESOME. So I’m excited. I also need to figure out how to accomplish things around a 10AM-6PM shift. I meant to go to the gym in the morning before work but I’ve been semi-sick all week and it’s only happened once. I love sleeping in! Problem is, by the time I get home from work and eat dinner and check my internets things it’s dark and late and I’ve wasted away the whole day. Hopefully next week is more productive. I woke up before my alarm today so that’s a good sign. Previous Previous post: Richmond Night Market, Still Open!